I'm not going all Ben Horowitz on you. But imitation is the finest form of flattery and I do like how Ben rolls on his blog and in the venture capital business. I'd like to talk this morning about how hard it is the come up in the venture capital game. I work with a bunch of VCs who are in their early 30s and have less than five years in the business. They work hard, put in ridiculous hours, are on top of all the latest trends, companies, technologies, etc. They meet with tons of companies every week, work hard for their portfolio companies, and are on planes flying around to the important confereneces and demo days. I can assure you they are working harder than I am. But when it comes to winning deals, they have a distinct disadvantage. They can be working on a deal for a year or more, and then when the entrepreneur decides to raise funds, a more experienced VC such as myself can swoop in, spend a week or two building a relationship with an entrepreneur, and take the deal away from them. I've seen it happen. I've done it myself. They make rookie mistakes. They let a reporter hang out with them for a week thinking they can trust them. They talk when they should be listening. They overpay for deals thinking that will win the deal for them. They use their phones in board meetings. They fight with entrepreneurs over meaningless things. When I see these things I cringe. Because I've been there and done that. I spent the first ten years (maybe 15) of my time in the venture business as a young VC trying to make it in the game and not really knowing how. I've made all of these rookie mistakes and more. I feel for them, I often mentor them, and I really enjoy working with young VCs. When a young person asked me about getting in the venture capital business, I advise them not to. I think VC is an experienced person's game. Startups are not so much. Startups are a great place to be in your 20s and 30s. VC is a great place to be in your 40s and 50s. I look at Ben and his partner Marc and think "they did it right." They got into the venture capital business when they had all the experience one could ever want working with startups. They don't lose deals to more experienced VCs. They win deals over more experienced VCs. But of course many young VCs made the decision to get in the game at an early age and are committed to making it work. They are going to have to take their lumps. Make the mistakes. Learn from them. Continue to work harder for less results to show for it. And lose deals they should win. One of the things I did not do very well that many of these young VCs are doing much better is building relationships with more experienced VCs. As I said, I work with a bunch of them. Teaming up with a more experienced VC can help you win a deal, you can learn from them in the board room, and you can ask them for advice when you screw up. Going back to where we started this post to end it, I like how Jay-Z and Memphis Bleek partner up in Coming Of Age. That's the way to do it. There are signs that Washington is gearing up to do something big in the area of online privacy. The FTC put out a report earlier this week and the White House called for a "privacy bill of rights" last month. Both have asked Congress to act on this issue. I thought I'd lay out some basic thoughts and principles on the data we create, share, and curate on the open Internet. 1 – Our clickstreams, search history, likes, tweets, photos, and so on and so forth is our data and we should have the ability to control it, delete it, and limit how it is used. That seems like a basic right that should be available to everyone who uses the Internet. 2 – Those who do not want to be tracked should have the ability to opt-out of being tracked. The Do Not Track industry self regulation effort (in browsers, ad networks, etc) is long overdue and I hope we see real usable tools soon. The FTC expects these tools by year end. I hope they are right. 3 – Tracking and profiling provides real value to me and many users on the Internet. I like using Amazon and getting recommendations based on my purchase history. I like using Twitter and getting recommendations for who to follow. I like using Foursquare Explore and getting recommendations for places to go to based on my checkin history and my friends' checkin history. We should not do anything to limit the ability to offer these valuable personalization services on the web and mobile Internet. 4 – There are significant Internet revenue streams based on profiling and tracking. Much of the online advertising business is built on these approaches. And an increasing amount of commerce revenue is based on recommendations and personalization. We should be careful not to undercut the economic underpinning of the Internet in our attempts to regulate online privacy. 6 – There is a big difference between collecting data and using it within a web or mobile service and collecting data and selling it to third party services. I understand that the data Foursquare has on me will be used by Foursquare to make better recommendations and to target offers and specials to me. That makes sense and my decision to use Foursquare and continue to use it is an implicit license for them to do that. But I cannot use that same implicit license when the data on my activities is collected and sold to third parties. 7 – With the advent of open APIs, much of this data is not actually being sold, but it is moving freely around the web via the plumbing of the Internet. This is an area we should be particularly careful not to crimp. Open APIs are at the center of the permissionless innovation movemement and are responsible for many of the new services that are being built. I do not have a specific set of recommendations for our elected officials on this issue. But I do agree that codifying best practices and policing the truly bad actors is a good idea. The Can Spam Act of 2003 is a good example of how industry self regulation codified in legislation was a net positive for everyone. That bill took a lot of work by the industry trade groups to get right and there were versions of Can Spam that would have be highly problematic for the industry. I suspect that will be the case with online privacy legislation too. So everyone working in the Internet industry should make their voices heard in Washington on this issue. If you have a business that will be impacted by online privacy legislation, figure out how to engage in the debate/discussion. And the staffers in Washington who are working on this effort should reach out to the Internet industry (and not just Google and Facebook) to get a front lines view of the issues. If you don't know how to do that, you can contact me via the contact link at the bottom of this blog. I was going to post today on the brewing online privacy discussion in Washington but then I saw this video in my twitter feed. It was made by the New York Tech Meetup and is a three minute public service announcement about doing your startup in NYC. I did sit for the film but was left on the cutting room floor. That's just fine with me. It came out great and so today's post will be an advertisement from NYC to all entrepreneurs out there. We will resume regular programming tomorrow. Can You Build A Network On Top Of Another Network? By now, regular readers of this blog should be pretty familiar with USV’s investment thesis centered around investing in large networks of engaged users that have the potential to disrupt large markets. I’ve mentioned it frequently here and my colleagues have also blogged regularly about it. @delamothe are they networks if they are built on top of another network? I think it is possible to bootstrap a network on top of another network. Stocktwits did this on Twitter and Zynga did this on Facebook. But both of them eventually built their own networks directly on the web and mobile. Zynga still gets a ton of game play on Facebook and Stocktwits continues to benefit from tweet distribution on Twitter, but they have made the necessary investments to operate their businesses in such a way that they are not entirely dependent on other networks. In the case of Stocktwits, they did this early on. In the case of Zynga, they waited for a while to do this. But my question to Jon is a bit different. I didn’t ask if you can build a network on top of another network. I asked if it is a network if it is built on top of another network. I think in that case, the answer is no. There is a third way, which are networks of networks. My partner Albert has blogged about this and I am 100% in agreement with him that this is the way the market should evolve. I believe that the Internet is an operating system and the networks that operate on the web and mobile via the Internet should interoperate with each other, share traffic and distribution with each other, and act as peers with each other. This is in keeping with the architecture of the Internet and is the most sustainable model and the one I am betting on in the long run. Like a well functioning startup or a top flight sports team, the chemistry between the participants on a Board must be strong. That doesn't mean they need to be best friends who hang out with each other outside of the job. It does mean they must respect each other and lean on each other's strengths to get to the right decisions. When you are building a Board, you must think about chemistry as much as you think about it when you hire a team. You want to have a Board that can work well together. And you need to invest in chemistry after you've assembled your Board. I like regular Board dinners before or after the meetings. There is nothing like breaking bread and having a beer or a glass of wine to get folks to relax and connect. I also like annual Board offsites where the group spends an entire 24 hours together, usually talking about and plotting strategy for the coming year(s). These activities outside of the Board room are critical to developing and investing in Board chemistry. Once obtained, you cannot let Board chemistry calcify. You must continue to invest in it for the long haul. Sometimes you will have a Director (or two) that just doesn't fit in. Unless that Director has a contractual right to their seat (usually as a result of investment) or brings a critically important skill set to the Board, you should seek to remove that person from the Board and replace them with someone with similar skills who will fit in better. Even when an investor has a contractual right to a Board seat, you can get one of their partners to replace them in an effort to get better Board chemistry. Don't take this approach lightly however. It will be seen as a hostile move by the person you are seeking to replace. I have been involved in these situations a few times and it must be handled delicately, usually via the senior partner of the firm involved. If the person who is serving on your board that you are seeking to replace is the senior partner of the firm involved, then you have an even more difficult problem. If there is one point that I want to drive home more than any other point in this entire series on Boards, it is that your company needs a strong Board and you must do everything in your power to make sure you get one. Don't accept that you have a dysfunctional Board and you have to live with it. If you have a bunch of investors on your Board that you can't get rid of, seek to add a bunch of independents to balance them out. And then build chemistry between the independents and the investors. Group dynamics are an interesting thing. Adding or subtracting one or two people from a five to seven person group can dramatically change the chemistry. So pick your Board members wisely and if you have an issue, deal with it to the best of your powers. I think Matt Blumberg, CEO of our portfolio company Return Path, has done an incredible job in developing Board chemistry. He has removed and replaced a number of Board members over the years, including an investor director. He invests heavily and continuously in Board chemistry. And he has assembled a set of strong personalities with very diverse strengths (and weaknesses) and he gets more out of us that I could possibly imagine. He should write a book on this topic. I bring up Matt and his success as a way to suggest that seeking advice and counsel from other entrepreneurs and CEOs can be a good way to think about how to improve your own Board. And you might want to consider some of them for independent Board members while you are at it. Your company is going to have a Board. It should not be an afterthought. It needs to be well constructed, well managed, and it needs to function easily and efficiently with strong chemistry. When you achieve all of those things, you will see that a great Board is a tremendous asset to a company, and you should pat yourself on the back for doing something that very few manage to accomplish. I've written 5,680 posts according to Typepad. There are a lot of gems in the back catalog here at AVC. So I'm occasionally going to feature old and possibly forgotten posts under the tagline From The Archives. I've been playing a lot of poker while on our ski vacation. The youngsters think they've got game and in fact they do. But I've been holding my own and am up nicely on the week. Which brings me to a post I wrote in November 2004 called The Poker Analogy. Here it is without the intro and with a few edits. Poker is an incredible game. It is about risk management and knowing when to go for it and when not to. So is the VC business. Early stage venture capital is a lot like poker. The first round is the ante. I think keeping the ante as low as possible is a good thing. I like to think of it as an opportunity to play in the next round and to see the cards. Clearly, we don't ante up to just any deal, but it is very useful to think of the first round as the ante. For the first year or 18 months, however long the first round lasts, you get to "see your cards". You learn a lot about the management team. You learn a lot about the market you've chosen to go after. You learn about the competition and a whole lot more. Then you have to decide whether to you want to see "the flop", that is the next year to 18 months. The price to see that is usually higher. If you don't like your cards (ie the management team, the market, the competitive dynamic, etc) then you fold. Cut your losses. Preserve your capital. Wait for the next deal. In poker folding is simple. In the VC business, it's not that simple. Sometimes you can fold by selling the company or the assets. Other times, you need to shut the business down. It's not easy and many inexperienced VCs make the mistake of playing the hand out because they don't want to face the pain of folding. That's a bad move. If you structure your deals appopriately, you can often get three or four rounds (three or four flops). As your hand strengthens, the cards get better, you increase the betting, putting more money at risk in each subsequent round. That's how smart poker players win and its also how smart VCs win. The poker analogy only works so far. Bluffing doesn't work in the VC business. If you've got a bad hand, you really can't bluff your way out of it. But on the other hand, you can impact the cards you've got. You can work with management, beef it up, switch markets, buy some businesses, etc. You can significantly improve your hand if you work at it, something that's not really possible in poker. This is why I think VC is mistakenly seen as risky. Sure the ante is very risky. But if you play your hands right, the subseqent rounds are much less so, and the fact that you can put most of your capital to work in the later rounds makes the total portfolio a much less risky proposition than the upfront ante. This past thursday, the Senate voted 73-26 to approve its version of the JOBS bill. The House had previsiously approved a similar bill and the process will now go back to the House to come up with a modified bill that can be approved by both the House and Senate. I hope they make quick work of that and present the bill for signature to Obama who has committed to sign it. I suspect most readers of this blog know a bit about this bill. The three provisions that are most meaningful are the crowdfunding provision, the increase in shareholder ceiling for private companies from 500 to 2,000, and the "sub $1bn revenue IPO" provision that we discussed previously here at AVC. I had held off blogging about the crowdfunding provision because frankly I had some reservations that I had privately discussed with friends, colleagues, and elected officials. I did not want to publicly throw cold water on this provision, but I privately hoped that the provision would be modified to help insure that equity crowdfunding of startups doesn't become a fraud infested sector of the capital markets. Under the Senate amendments, any company using crowd-funding methods must still file some basic information with the S.E.C., including the names of directors, officers and holders of more than 20 percent of the company’s shares, plus a description of the business and its financial condition. Companies seeking to raise $100,000 or less must also provide tax returns and a financial statement certified by a company principal; those raising up to $500,000 must provide financial statements that are reviewed by an independent public accountant. Companies raising more than that must provide audited financial statements. The Senate also inserted requirements that intermediaries seeking to help companies raise money through crowd-funding must register with the S.E.C., make sure investors are advised of the risks they are taking, and take measures to prevent fraud. I am a huge fan of allowing every person, not the just super wealthy and institutions, to participate in the funding of startups. Frankly its a shame that the average Facebook user has not been able to own shares in Facebook during its increase in value from zero to $100bn. The same kind of thing can be said about Twitter and many other of our portfolio companies. The changes to securities regulations in the JOBS bill are fundamental and important and very much needed. But it is also true that investors are due some basic disclosure when parting with their capital. If they choose to ignore the disclosures, then that's fine. But the disclosures should be there for them when they want it and/or need it. The Senate was wise to add some basic disclosure requirements to the crowdfunding bill. I suspect the disclosure requirements might get toned down a bit in the final bill and that is probably a good thing. Requiring an audit for a $500k seed round seems a bit nuts to me. As for the changes to the shareholder number rule (increase from 500 to 2,000) and the regulatory relief for "sub $1bn revenue IPOs", I am ecstatic about these new rules. Our portfolio companies have spent countless hours handwringing about the existing rules. They have made important decisions based on the current rules which are unnecessarily stringent and have hampered their access to capital. These new rules are much needed regulatory relief for startup companies. Finally, I'd like to thank our elected officials for coming together in a non-partisan way to address an important set of issues and deal with them sensibly and corrrectly. This doesn't happen enough in Washington and we need more of this. I know that the majority leadership in the Senate, particularly Harry Reid and Chuck Schumer, fought back a mini revolt among the left wing of its party to get this bill passed. I applaud them for doing that and standing up for something that was not popular in their caucus. That is leadership and I appreciate it and I am sure the readers of this blog do too. 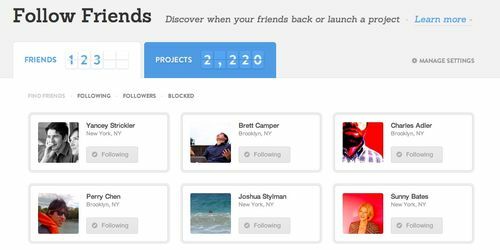 As you can see, I am following a total of 123 friends and they have backed a total of 2,220 projects. However, it's not the projects they have backed in the past that is the big deal. It is the projects they are backing in real time. When they do that, I get an email letting me know they backed a project, with a link so I can go join them. That's the feature I've wanted since the early days of the service. My friend Whitney built a hack that did this a while back. He called it Kisttr and I used it along with a bunch of friends. It worked well but Follow Friends is the fully implemented and integrated version of this simple idea. Of course, this is nothing new for web services. This is state of the art actually. It's amazing that Kickstarter has gotten so huge without a social fabric. I'm excited to see how Kickstarter evolves this social fabric now that they have it. I think this simple feature just made Kickstarter so much more awesome. Thanks Kickstarter team for finally giving me my #1 feature request. Our portfolio company Disqus has been building its next generation commenting system which they are calling Disqus 2012. They are getting ready to release it into beta and they are looking for bloggers who want to be beta testers for it. Disqus 2012 is a fresh take on the Disqus system — both a bit of rearchitecting and a bit of reimagining. We think we can build a version of Disqus that fully resonates with our original purpose: build delightful discussion experiences for the participants. If you are a blogger and would like to be a beta tester of Disqus 2012, then you should sign up to be a beta tester at Disqus Labs. You'll be asked to take a very short survey in order to join. I just did it. It took me less than three minutes. Also, at Disqus labs, you'll see a cool real-time comments map that you can filter by domain and a forums like web app that was built on the Disqus API. I have seen Disqus 2012 in action and it will be running here on AVC as soon as Daniel will let me have it. I am confident it will lead to a lot more engagement and activity. Which is saying something since we aren't lacking for any of that right now!